Developer Description : Taking a leaf from the Gauntlet school of games, Skein is a fast paced one or two player (co-op) arcade game where you battle through hordes of monsters on a quest to save the soul of a talking sheep. 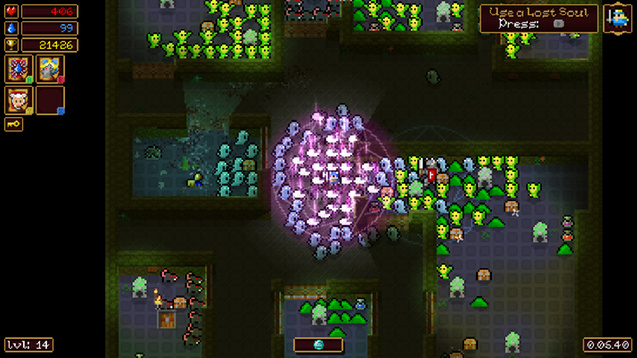 The game features hundreds of enemies, a huge number of spells, 6 different playable characters and procedural dungeons with secret rooms, traps and all! Procedural Dungeons - All dungeons are procedurally generated in the game meaning that you never get the same challenge twice. 3 Classes, 6 Characters - Mage, melee or ranged? Choose your class, then choose your character... then give them a unique name so you can love them forever! Dozens Of Magic Spells - 25 spells per class, plus 25 more general spells that stack and combine to give you 100+ awesome powers. 1 or 2 Player Co-Op - In true arcade style, Skein can be played by one orr two players in Co-Op mode, and players can drop in/out at any time. And Much, Much More! - Champions, arenas, caves, traps, boss battles, treasure rooms... Skein is packed with too much to mention here!